I went on a streak of Kickstarter projects last year. I enjoyed helping to fund several small projects, and I received some rewards along the way. One of those rewards just arrived, and I’m super stoked about it. 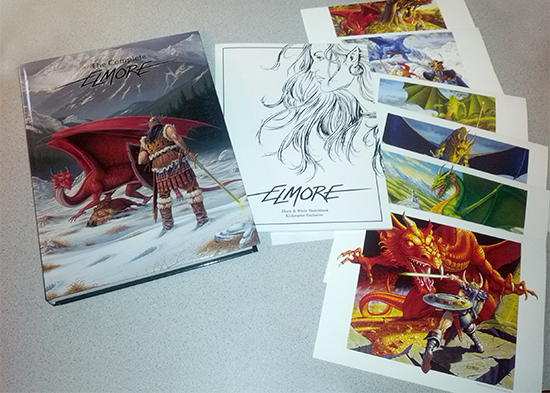 I’ve been a fan of Larry Elmore’s artwork since the 90s, and this book is probably one of the best art collections I’ve ever seen. It’s not simply a collection of his work. Rather, it includes information about his upbringing, his time in the Military, and the early years of D&D Artwork. I wrote about how Larry gave me some great advice on one of my pieces earlier this year. I’ve taken that advice to heart, and I’ve been very happy with the results. In fact, I followed up with the two characters in that previous piece to create the one you see up above. There’s a funny story behind this piece: when I was at GenCon earlier this year, a father with three daughters came to the booth. They were interested in my “Her First Doll” image, and we got to talking about artwork in general. I told him that I was considering a second piece with the same father-daughter combination riding on the motorcycle that the father is building in that image. When I suggested that it would have a sidecar for the girl, he cut me off. “No,” he said, “you should have her driving and him in the sidecar.” The light went off, and I set to work on the piece immediately after the show. If he comes to the booth next year, I plan to give him a free copy of the print. I’m really happy that I was able to apply some of the knowledge I attained this summer, and I look forward to finding opportunities to apply it again in the future.